I sure could use some help (your help) in getting the word out about this most recent discovery of life on Venus. Though it seems NASA has other ideas as to how this discovery should be handled or not, as I'm still on a need to know basis and thereby uncovering information on what I feel is a restricted basis. This of course makes absolutely no sense, considering the overwhelming importance of this discovery. 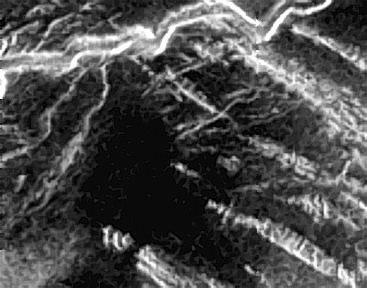 Since December 2000, I (alone) have discovered (from within an official NASA Magellan image) the most likely (easily viewable) signs of alien life outside of Earth. This is something which I believe has been long overlooked (nearly 10 years) by NASA, as well as by all other astronomy researchers. I have been sending NASA my information as well as images (several variations all depicting the exact same features) strongly supporting my findings that substantial structures and infrastructure clearly exist (at least at one elevated location) on Venus. However, I have become to believe that there may be very good reasons why NASA keeps stating and re-affirming that nothing "NOTHING WHATSOEVER" exist within my discovery, this most likely is due to embarrassed about their crack team(s) being so totally caught off guard, pants all the way down and apparently without an official response, due mostly to their own "NON-DISCLOSURE" bylaws (no employee can state or admit to anything without prior official approvals, and this takes time, could take years), let alone to offer any form of credit towards an outsider, as that might also be against their unwritten bylaws. Unfortunately (perhaps for NASA's semi-pristine image), I truly believe this could be the discovery (one and only to date) that which rockets their fledgling budgets and recreates true mission focus, so I am still hoping NASA can eventually turn their attentions around on this remarkable opportunity. For beginners (remember this is nearly a decade old Magellan file image), it takes only the most basic photo software in order to exploit a relatively small area (representing as little as 5% of the original image area) so that minor features (as they become enlarged) offer more pronounced details (not altered or in any way distorted). For this purpose I applied several solutions including COREL Photo and ADOBE Photo Deluxe, each accomplishing the task, with the Adobe product offering for me just a little better and faster results (COREL can apparently do the job nearly as well, however, it simply offers far too many options for my limited brain to learn, but then I'm still working on that). Either process (including the combining of both) appears to have no indications of adding distortions or otherwise introducing anything false, as the original raw file information is still all there (this is not to say that you can't distort or otherwise alter the image, because you can, but such efforts will easily stand out and be detected). I simply can not be accused of faking nor intentionally introducing anything, as I'm certain NASA utilizes this very same or I would hope better process or at least by now wishes they had. I have provided to several NASA web sites and sent multiple e-mails of this information (including to their moles at "uplink.space.com") along with the image area enlarged (which I now refer to this area of discovery as "GUTH Venus"), and thereby I have forwarded nearly everything I have onto several identifiable NASA individuals (trust me, this is has been easier said then done, and truly becoming more trouble then it is worth). Now it seems as though I am being ignored and otherwise informed by NASA that what others and I see is merely that of common rock, erosion and channel formations, and not even a "thank you very much for putting all this together and bringing it to our attention on your own time and expense". At this point I'm beginning to understand that this could be NASA's only option at this juncture (sounds a little like someone's job(s) are on the line). What clearly is to be understood in all of my enlarged and recorded images, such as guth-venus-180-A.jpg and many others, are that of clearly identifiable vertical and rectangular structures depicted with having roof, entrance and rounded features, plus that of an obvious causeway (most likely suspended) supported by and/or passing through a tall (extremely tall) intersection structure, and at the West end having parabolic looking structures, an issue of a out-fall flow-control or observation just below, as that attached to a "U" shaped consideration such as having a trough or ramp extension at it's midpoint and directed towards the SE overlooking steep and extremely deep terrain. In addition to the primary rectangular structures at the West and East ends of a main causeway, there are several adjoining and/or nearby structures, above all of this is an extremely large and long (flat surfaced) platform/runway having two or three distinct sub-level staging or storage access areas and formed as having rounded bay corners. All this construction is located in a most likely area and elevation for the potential of power generation as well as underground access and thereby protective equipment storage attributes. To the NW (above the main channel) is that of a road and clearly a bridge consideration, and further west is what could very well be the exposure of a hanger or horizontal silo/launch bay issue as well as background supporting infrastructure, and above this is what could be that of substantial collection basins and/or reservoirs. Keeping all of this in perspective; The original NASA/Magellan image offers all of this raw information as well as some limited measurement capability. The original GIF image/pixel (according to one at NASA) could represent as little as 25 meters/pixel, however, other resources at NASA have been proclaiming this image represents 225+ meters/pixel. I'm still reviewing data that suggest the imaging aperture (utilized for the 15 degree imaging scans) may have been obtaining as tight as 75 meter resolution. I have also discovered there was an optional 5 degree aperture capability that could obviously have been utilized to obtain a 25 meter or better resolution, and I feel it's therefore possible that this original image was inadvertently labeled as that of a 15 degree scan format. Resolution is obviously of great importance, as it certainly established relative size (from my point of view, bigger is obviously better as far as the significance of structures are concerned) however, even if this image were to represent that of only 25 meter per pixel, of the greatest overall help is that this image was acquired at approx. 43 degrees, which as you or anyone can see from all of the nearby terrain and those rather substantial (3 clustered) mountain/rocks offers an exceptionally good perspective vantage if you were to be searching for anything out of the ordinary. In the past I have requested clarification on these issues, nothing further nor definitive has been offered (it's as though the Venus/Magellan case has been closed and sealed forever). This imaging resolution is something worth exploring, as this would obviously help establish the size of structures and perhaps otherwise explain this; why would NASA even bother to ignore or suppress this issue. In spite of what NASA has been telling everyone, this is not a joke, it is as real as it is ever going to get, as my enlargements appear to have made this a fact bigger then life (perhaps a little too big). Simply in no way are all of these structures, complex shapes and associated infrastructure merely that of common lava flows, rock and erosions (as NASA states). Complex shapes reveled are not those which I or anyone simply created nor introduced (as the surrounding terrain proves this out) and I can say this with utmost confidence because, NASA has not and apparently can not offer any such evidence towards their point of view as evidence this area is exactly like all other areas of Venus (as others and I have looked extensively, equally enlarged using the very same process and discovered nothing remotely similar). I have requested NASA or anyone (including their moles) to provide such evidence as taken from that of Venus or any other planet, including Earth supporting the same degree of such complex structural looking yet of naturally formed elements. What gives with NASA ?, What is their problem ?. Please, can you offer any explanation(s). Keep reviewing some of my latest enlargements, better yet, accomplish your own enlargements (I'll help if you ask), and then review some of my basic ideas as to what I believe can be seen on Venus. Let others and me hear your reviews and ideas, and especially if you should discover another area of interest. My URL index for all this is geocities.com/bradguth/ and some of my latest updates have been applied into my (htm) recap @GUTH Venus, which is another work in progress.